We are active in the following viewpoints to Work Energetically with Mutual Respect for Each Other. 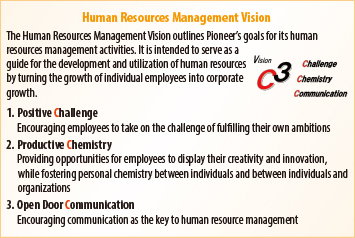 In an effort to realize our Group Vision, Pioneer will work to create an environment where a diverse group of employees, who maintain their professionalism, are able to work to their fullest and create new value, irrespective of their age, gender or nationality. To this end, career development for women and middle-aged seniors is a key issue that is addressed in our corporate strategy. Regarding career development for women, female staff in management positions accounted for 3.2% of all managers as of the end of April 2018. To achieve our target of 3.8% by the end of March 2021,we are implementing the following measures. Pioneer actively promotes initiatives to help employees balance work and child/nursing care. Regarding balance with childcare, since 2007, the Company has been continuously certified with the Next Generation Certification ”Kurumin“ mark issued by Japan&apos;s Ministry of Health, Labour and Welfare. As for balance with nursing care, we hold nursing care seminars to prevent employees from leaving their jobs to become a carer for a family member. We also offer e-learning and conduct employee questionnaire surveys to facilitate understanding of the systems available and prevent harassment of employees who wish to use them. In this way, we are improving the environment conducive to achieving a balance between work and child/nursing care. Pioneer continues to actively promote meaningful and worthwhile relationships within its organizational structure. As a part of these endeavors, the Company introduced a mentor system from September 2007 in an effort to promote employee career planning and positive growth. The initial system covered 21 female managers, and it is currently being expanded to include candidates for executive positions as well as new female employees. In order to fulfill its corporate social responsibility and to employ a diverse workforce, Pioneer has consistently undertaken initiatives to employ people with disabilities. Pioneer will continue to take active steps in this direction, expanding the range of occupations available to people with disabilities throughout the Group as a whole. Health management of employees is more than just a matter of health and safety, and Pioneer regards the development of both the Company and its people as an important management issue. Therefore, Pioneer takes a preventive approach to mental health care, holding seminars for employees, distributing promotional materials to raise awareness of the issue, improving its Health Care Section, and building a counseling service system. In addition, the Company has developed a program for helping employees who have experienced mental health issues to return to the workplace. In preventing work-related accidents, Pioneer believes that maintaining and improving a workplace environment that takes into account the safety and health, both mental and physical, of employees is important to ensure that they can carry out their work with peace of mind. At each business site, the Health and Safety Committee develops and implements accident prevention and safety improvement measures that are relevant to each workplace. Pioneer is also working to strengthen cooperation among business sites through the activities of the Health and Safety Committees. Pioneer has established a Human Resources Management Policy that serves as a standard for hiring and managing employees and gives guidance on planning and operating its personnel systems and measures. Pioneer has set forth its personnel training policy and implemented measures that assist employees in developing a career mindset and growing through out personnel policies, on-the-job training, off-the-job training and personal development. In addition, Pioneer offers programs at various levels which are created around the core components of basic attitude, management, global personnel development, as well as knowledge and skills for executing operations.